Why would I need self storage in Woodside, NY? There are a variety of reasons why you might need self-storage in Woodside, NY. How much is a storage unit in Woodside, NY? The cheapest storage unit in Woodside, NY is $83.00 per month. What size storage units do you have available in Woodside, NY? In Woodside, NY we have sizes that range from 5'x5' to 10'x30' to suit your storage needs. How much is it for a 5'x5' storage unit in Woodside, NY? The cheapest 5'x5' storage unit in Woodside, NY is $83.00 per month. On the west side of the borough of Queens, Woodside is a thriving New York City neighborhood. It has a dynamic commercial core, a mix of high-density housing and quiet residential communities, and convenient access to the rest of New York City. Like the rest of New York City, Woodside was settled by the Dutch in the early 17th century. Shortly after English settlers took over the area, Queens was established as a county, and the area rapidly urbanized in the 19th century. The neighborhoods of Woodside, Flushing and Jackson Heights began to develop their unique identities in the mid-20th century. Throughout the 20th century, Woodside welcomed people of many races, ethnicities and religions. As a result, the Woodside of today is an extremely diverse community, with many cultures enhancing the local art and dining scenes. Like much of GreaterNew York City, Woodside has a thriving economy. The area's largest employers include several health care providers – Memorial Sloan Kettering Cancer Center, Montefiore Medical Center, Mount Sinai Hospital, New York-Presbyterian University Hospital, North Shore-LIJ Health System and NYU Hospitals Center. Columbia University, JPMorgan Chase Bank, business services provider New Partners and electric utility Consolidated Edison are also major employers in the area. 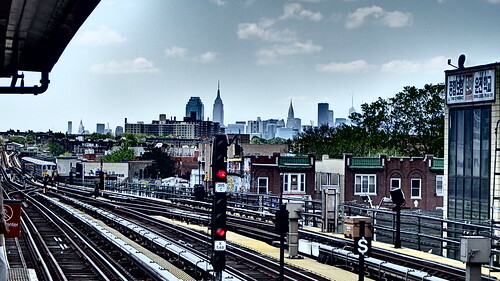 One of the biggest benefits of living in Woodside is the easy commute to nearly any area of New York City. With such as large job market within reach, you should be able to easily find a job that's a good fit for you. Woodside students enroll in schools operated by the New York City Department of Education. You'll also find a number of private and parochial schools throughout the Queens area. Utilities: The primary utilities companies in Woodside and the larger New York City area are Con Edison and the NYC water department. Garbage and Recycling: You can expect regularly scheduled trash collection, whether you're in a single-family home or an apartment. Most single-family homes in Woodside have curbside collection..
Transportation: Like most of New York City, Woodside has excellent public transit options. You can use the New York City Subway, the Long Island Rail Road and the Brooklyn-Queens Expressway to get around. For affordable homes in Woodside, look near Doughboy Park and along Hobart Street. If you're working with a larger budget, you can find spacious homes along 58th Street and the Brooklyn Queens Expressway. Renting is fairly common in Woodside, so you'll have many options if you'd prefer not to purchase a home. Apartments, town houses, condos and rental homes are available throughout the community. Our lowest priced units in Woodside, NY average $105.50 per month. 132 people have reserved units in Woodside, NY in the past 30 days. There are 2 locations within Woodside, NY's city limits. There are 2 locations in Woodside, NY that offer AC and Heating features.